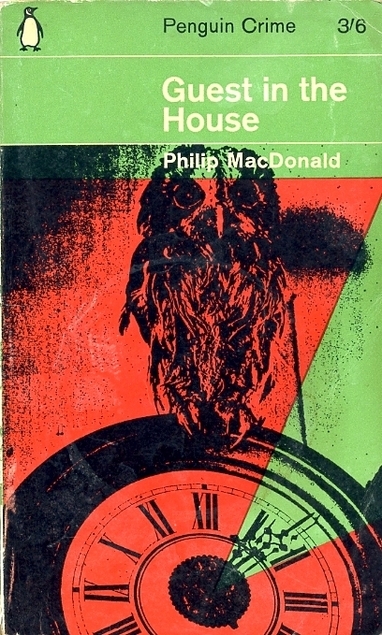 Guest in the House by Philip MacDonald was first published in 1956 and it’s the first book by the author that I’ve read. He wrote under various names and he was one of the many men who took to writing thrillers/mysteries after serving in World War 1, but writing was obviously in his blood as his grandfather was the very successful Victorian Scottish author George MacDonald and his father Ronald was also a writer. The setting is California where an Englishman who had been a Lieutenant Colonel in WW2 is so down on his luck that he decides he must visit an old wartime friend of his. He is driving a borrowed Alfa Romeo so on the surface Ivor Dalgleish St Pelham St George, V.C, D.S.O is very respectable and well to do looking, but in fact he has only a handful of dollars left to his name, hence the visit to his old friend, whose life he happened to save during the war. From the beginning the reader realises that he’s a con man. Jeff Gould is very happy to see his old friend although his wife Mary isn’t so keen, but their house guest makes a best friend of the daughter/step daughter of the home so it’s two against one and she has to make him welcome. There are tensions within the marriage though which is a second marriage for Mary and the strife is caused by Mary’s first husband Victor who is demanding to have more access to his young daughter. His daughter doesn’t know him at all, Mary is determined to keep her away from her ‘dodgy’ father who has tricked her into signing an unusual divorce/child access agreement. Victor has already squeezed $10,000 from the couple to stay away from them, and that has caused them a lot of financial problems and now Victor has come back for more money. I’ll give this book three stars on Goodreads I think. It’s well enough written but I wasn’t comfortable with the plot which involves a decent couple being manipulated by two very unlikeable men. I’ll definitely try another of his books though if I come across any on my wanderings. 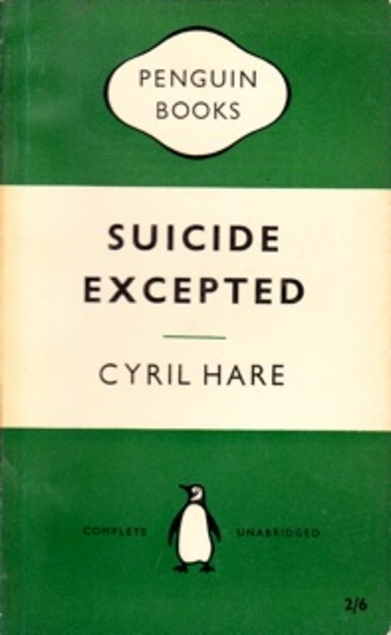 Suicide Excepted by Cyril Hare was first published in 1939 and it’s the first book by Cyril Hare that I’ve read. His real name was Alfred Gordon Clark and for his day job he was a judge, that must have given him plenty of ideas for his writing. Inspector Mallett of the C.I.D. has just had a very disappointing lunch in the roadside hotel where he is having a short break. A brief chat of mutual commiseration with another guest on the poor food on offer leads to Mallett becoming a witness in a subsequent inquest. Was it murder, an accident or suicide? A lot rests on the outcome and this one kept me guessing so I’ll definitely read more by this author. 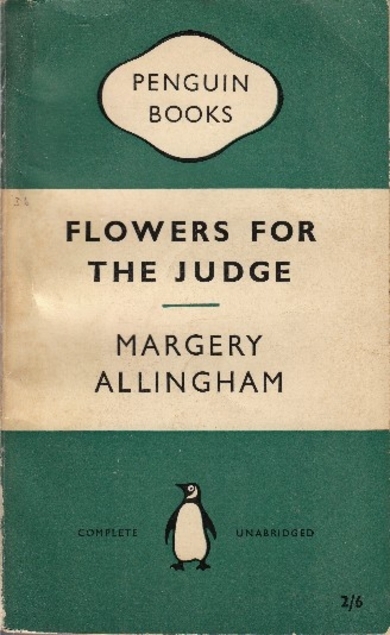 Flowers for the Judge by Margery Allingham was first published in 1936 and I must say that I loved it. I think that Albert Campion’s character really improved in this one, in some of the earlier books he’s just too sketchy for my liking. It always seems to be Allingham’s The Tiger in the Smoke (1952) that people cite as Allingham’s best book but I wasn’t so impressed with that one. Allingham dedicated this book to her publishers, presumably because the setting is a firm of publishers called Barnabas which has been going for generations and is now run by cousins. It’s a very conservative, old fashioned firm although years ago one of the directors had disappeared into thin air. Twenty years on another director disappears although it’s some days before the alarm is raised by anyone. Paul is a bit of a strange person, married to Gina a much younger woman, an American, it’s a bit of a mystery why they married at all. The youngest partner is in love with Gina although she is completely oblivious of this fact. Campion gets involved in the mystery and with some twists and turns everything is satisfyingly sorted out. ‘As an American, Gina, you have a thrill coming to you. We are on the eve of a real old London particular, with flares in the streets, bus-conductors on foot leading their drivers over the pavements into plate glass windows, and blind beggars guiding city magnates across the roads for a small fee. 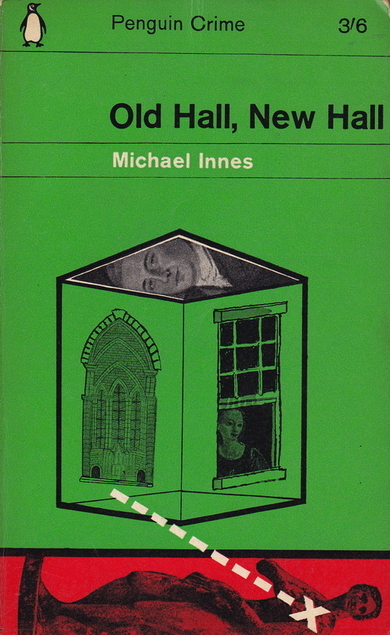 The title of the book comes from an old custom – judges carried a posy of flowers into the court to ward off gaol fever and nasty smells. You can read about it here. Obviously it was still being done in 1936 – at the Old Bailey anyway. Death of a Ghost by Margery Allingham was first published in 1934 and it’s the sixth Albert Campion murder mystery, so fairly early in his career and for me that’s the problem with this book. As he matured Allingham wrote Campion as a much more interesting character than he was in his early days, he’s just too shadowy and one dimensional, I much prefer the older married Campion. John Lafcadio was a great artist and he decided that to keep his name going as long as possible after his death he would paint several pictures to be unveiled after his death – one a year, beginning ten years after his death. I have to say that that is a great idea. It’s the eighth unveiling of one of those paintings, so eighteen years after his death, and there are lots of famous people at the party, suddenly the lights go out – a shilling is needed for the electricity meter, and there’s a murder! So begins Campion’s investigation, aided by Stanislaus Oates, but for me there’s just not enough of Campion and it’s all a bit predictable. The Wooden Overcoat by Pamela Branch was first published in 1951 but my copy is a 1961 Penguin reprint. 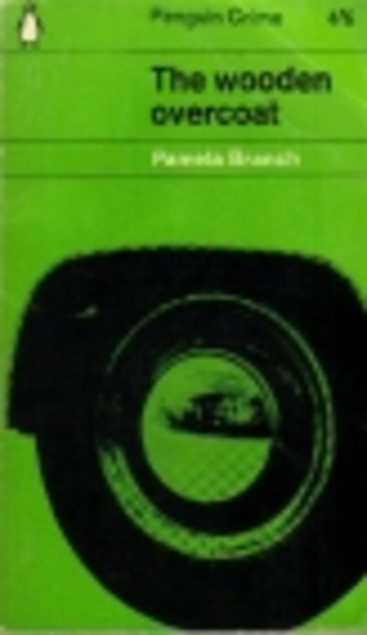 I had never heard of Pamela Branch before I came across this book but I’ll definitely be looking for more of her books. Sadly she only wrote four of them. If you don’t like any comedy at all with your vintage crime then this book won’t be for you, but I found it to be an absolute hoot. It begins with a murderer getting off with it, the jury has just brought in the verdict, but the reader knows that Benjamin Cann had indeed strangled his girlfriend. When he gets out of The Old Bailey he is befriended by Clifford Flush who takes him to his house in Chelsea, it turns out that it’s the headquarters of a ‘club’ and all of the members are murderers who have got off with it. For very good reasons they’re all very scared of each other. The house next door is inhabited by two married couples who are house sharing, they’re all artists of some sort and have decided to start taking in lodgers. Benjamin Cann is their first lodger and it isn’t long before murders ensue, but not at all as you would expect. This book has some wonderful characters and hilarious situations. It’s a real shame that it wasn’t made into a film by Ealing Comedies, along the same lines of The Ladykillers (1955), it would have been brilliant. The BBC have dramatised it for radio apparently but it isn’t available on the iplayer at the moment. If you enjoy comedy along with your vintage crime then you’ll love this one. I was lucky enough to pick this one up for about £1 in a local shop but the ones I’ve seen on the internet are stupidly priced. Yet again I wonder if anyone ever buys these wildly priced books. If you are wondering what I mean by The Ladykillers you can see it on You Tube below. This is another book which I bought second-hand purely because it is a vintage Penguin crime book. I had never even heard of the author Jean Potts before I picked this one up. Jean Potts was born in St Paul, Nebraska but she moved to New York. In 1954 she wrote her first mystery novel Go, Lovely Rose for which she won an ‘Edgar’ award. 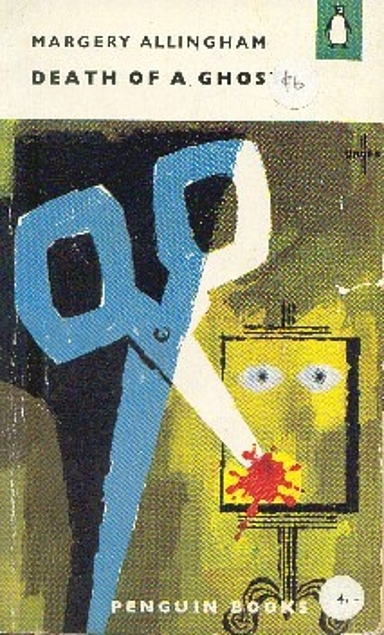 The Diehard was first published by Gollancz in 1956. On the Penguin cover it says: American small-town hatred makes murder a certainty. Lew Morgan is the top dog in the small town of Turk Ridge, he has plenty of money and when old friends find themselves in need of financial help it’s Lew that they turn to. But Lew had married for money, he didn’t love Olive but her father had been the one who ran everything in the town in his day and Lew just took over when Olive’s father died. Lew is a domineering bully, in control of everything and everyone, under the impression that his family and friends all admire and love him, but his controlling behaviour has made just about everyone despise him. This isn’t exactly a murder mystery but I did enjoy it and its surprising ending. G.V. Galwey is another author I had never heard of before, Murder on Leave is a vintage Penguin crime book, published in 1946. The setting is the Scottish Highlands where the body of a young woman has been found at the bottom of a railway embankment. It’s the body of a young V.A.D. who was the daughter of a prominent local landowner, Sir Alexander MacGregor. He has been suspected of having Nazi sympathies and had recently quarrelled with his daughter, Gruach. Yes that’s right Gruach, the murder victim had been given the same first name as Lady Macbeth. It’s Inspector Bourne of Scotland Yard who is investigating the murder and there are plenty of suspects, including German prisoners of war who have escaped from the local prisoner of war camp. By coincidence one of those prisoners had been known to the MacGregor’s before the outbreak of war. Despite the Scottish wartime setting somehow this one didn’t quite hit the spot for me. At times I found my mind wandering as I read. I don’t know if that was because of me or the book. I will give this author another go though if I ever do fall over any more of his books. I think I bought this one in Edinburgh but G.V. Galwey didn’t write many books and they seem to be quite difficult to get a hold of and expensive, on the internet anyway. I know I didn’t pay much for this one though. If you want to see what the author looked like have a keek here. 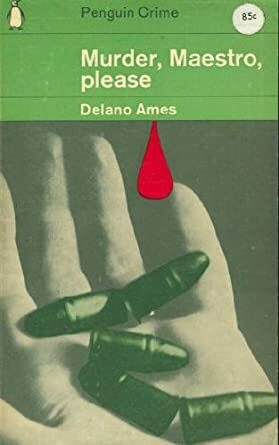 I had never even heard of Delano Ames when I picked up this book in a secondhand bookshop in St Andrews, and neither had the shop owner. As you would expect from someone with Delano as a first name he was American, you can read about him here. It’s a vintage Penguin Crime, and I can’t resist them. First published in 1952 this book features a husband and wife sleuthing team in the shape of Dagobert Brown and his wife Jane. As characters I loved them both and especially enjoyed what was a witty and realistic husband and wife relationship. The setting is the Pyrenees where the Browns are travelling on a tandem, an enthusiasm of Dagobert’s, Jane is less enamoured. They are on their way to meet up with friends at an hotel and then attend the Puig d’Aze Musical Festival. When they realise that someone is shooting and one of the shots almost hits them they’re understandably worried. Was it just a stray hunter’s bullet, were they the targets or was the driver of the red Bugatti which passed them the target? Dagobert is determined to get to the bottom of it. It’s all go and I was surprised more than once at the turn of events, so as usual I don’t want to say too much about the storyline. ‘If there is a more engaging couple in modern fiction than Jane and Dagobert Brown, we have not met them.’ – Scotsman newspaper. I hadn’t even heard of Holly Roth before I spotted one of her vintage Penguin crime books at the Edinburgh St Andrew’s and St George’s booksale. I find that very few Penguin crime books turn up at sales so I usually snap up any that I see. This book was first published in 1954 but it’s 1948 when the story begins. Terrant is an Englishman working as a journalist in Berlin, he took up that career after spending four years in the infantry during the war, before being wounded. Berlin is an exciting place to be for a 32 year old bachelor like himself but when he meets Ellen Content he realises that he has found THE ONE. Unfortunately she disappears after just a few days, and it seems to be linked with nefarious Cold War activities. Two years later Terrant sees her name printed in The Times. It says – “Among the other passengers is Miss Ellen Content of New York, who after a brief stay in England, is returning to America to fill a series of dancing engagements.” Apparently Ellen had sailed on the Queen Elizabeth and Terrant had to follow the lead. I enjoyed this Cold War thriller and I’ll read more of her books if I ever find any, but I am a complete cynic and really had to suspend my disbelief at the thought of a hard bitten reporter immediately falling in love and pining for years for a woman he had only met a few times. But that’s probably just me, I have very little of the romantic in me, which is a jolly good thing, and I’m sure that’s why we’ve stayed married for nearly 37 years!